A wedding themed slot might not be up everyone’s alley but Tie The Knot really makes great use of the ins and outs of a wedding day to create an engaging and exciting experience. This slot makes every nail biting and embarrassing moment of a wedding into some rewarding bonus features while the graphics and music perfectly set the tone and mood of the day. This slot has been developed by GECO Gaming, the company that emerged from the ashes of Wagermill and The Gaming Lab. They have been creating some excellent casino content since 2014 and Tie the Knot continues their legacy. Players should not judge the cutesy graphics here, there is a lot of game under the colourful and fun exterior. The slot uses a 5×3 layout and pretty standard 25 paylines on these reels. The RTP is below the general standard at 94% and the jackpot is set at 31250. The reel symbols include the bride and groom, of course as the highest value symbols. The bride is in fact worth more than twice as much as the groom! The couple’s wedding rings along with their pet Pug and ring bearer also show up along with two bride’s maids. There are also some elaborately designed lower value playing card symbols that pay out single digit wins. 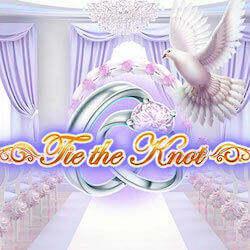 Tie the Knot has a series of wedding themed bonus games that all occur in order, emulating the real; wedding experience. Release The Doves – When 3 of the dove symbols land on reels 1, 3 and 5 you will activate one of the special wedding features instantly. Toss The Bouquet – Randomly during the base game the bride will toss her bouquet on the second reel, filling it with wild flowers. Get The Rings – Your Pug, Buster acts as the ring bearer. In this pick me bonus game Buster busts loose and runs away with your rings still tied to the pillow on his back. You must pick one brave and fast acting guest from a selection of four to attempt to retrieve the rings. Only if you retrieve the rings ill the next feature kick in. The Missing Speech – In Another Pick Me game, you must help your best man find his misplaced speech from under items in his room. The Wedding Gift – Once you have said your vows, you can enjoy the final bonus game, opening your wedding presents!